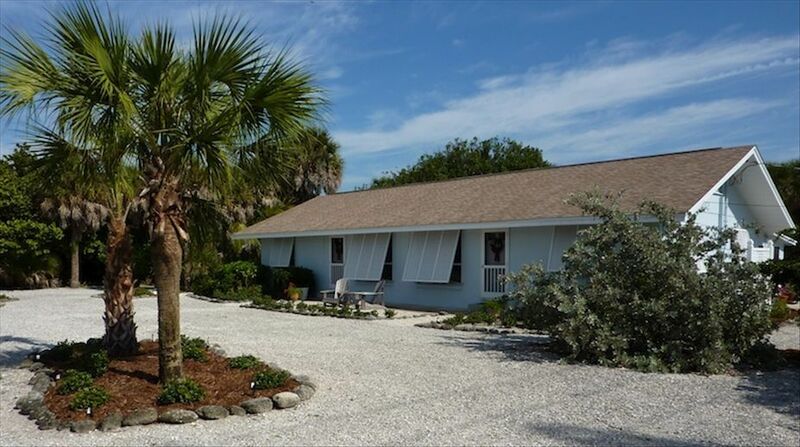 Boca Grande Beach House, South - Great Price! Great Location! The Boca Grande Beach House, South is 1/2 of a one-story duplex. The South unit has two bedrooms, a fully equipped kitchen, a bathroom, and a combination living room/dining room. The kitchen was completely remodeled in 2013 and the bathroom was completely remodeled in 2016. There is a large screened-in porch, a small front patio and a generous side yard with table, chairs and chaise lounge. You can choose to rent two bedrooms or four bedrooms, please call or email for clarification on pricing. The house is located directly across the street from a 7 mile, white sand beach with an unobstructed view of the sunset. It is located just to the north of and across from the historic Lighthouse. It is a short walk to the charming village of Boca Grande and the Boca Grande Community Center with a workout room and play ground. Tennis courts are at the end of our street. The seven mile jog/bike path runs directly in front of the property. In winter months, there is a farmer's market at the end of Wheeler Road. Once you on the island, you do not need a car. Golf carts and bikes can be rented in town. I can recommend a reasonable van service to pick you up at the following airports: Punta Gorda (PGD) 45 min., Sarasota Airport (SRQ) 1hr. 20min., Ft. Myers (RSW) 1hr. 30min., Tampa (TPA) 2 hrs, Miami (MIA) 3 hrs. This photo was taken in Dec.2011, when our family gathered at Boca Grande to celebrate my mother's 90th birthday. We have all enjoyed our visits to the island over the years. Mike and I live in FL, about 11/2 hrs. away, and are very 'hands on' making sure that everything is clean and in good order for our guests. Our family is very fortunate that my parents, who have vacationed in Boca Grande since the 1970's, had the foresight to purchase this property. It has been a wonderful place for our family to gather and enjoy over the years. We all feel a special attachment to Boca Grande. The house is casual and comfortable. It is in a terrific location on a large corner lot, directly across the road from the beach and an easy walk to town. Most of our guests choose to return year after year and consider it their 'home away from home'. toilet, shower, Bathroom was completely remodeled in 2016. Towels, bar soap and hair dryer are provided. We are directly across the road from a 7 mile public beach that is never crowded. It has picnic tables and a bathroom. Beautiful sunsets every night! Totally remodeled in 2013. New cabinets, appliances, granite counters, garbage disposal, lighting etc. The kitchen is fully equipped. Some provided. Fust Community Library has a complete selection and will lend to visitors. Bikes and golf carts can be rented on island. Closest Public Course is Rotunda, just off the island. Ceiling Fans in every room. I can provide the name of a reliable airport transportation service. An absolutely perfect location. We were at the beach every day. Close enough to town to use the golf cart to get around. Spotlessly clean house with a great layout and amenities. I have to agree with other reviewers - the beds are extremely challenging to get comfortable on- an easy fix! That is the only negative thing about this lovely spot. Lovely stay in Boca as always! Great house within walking distance of town, beach, and the lighthouse walking trails! Stayed there with my husband and 19 month old and it was very baby friendly- he loved the outdoor patio and the front yard area! Thanks for a perfect get-away! Great location. Nice hose. Spotless. Very considerate owner/manager. Thank you for your kind review! I hope you will come back again! Great home directly across the street from the beach. Home had everything needed for an extended stay. Great location,walking distance from downtown and the public beach. Thank you! We love our Boca Grande Beach House and are always happy to here when others do too!!! Thank you for the positive review! It was a pleasure having you at our beach house. I will look into memory foam beds. This property is very well maintained and very, very clean. We would have loved our stay here if the weather had just cooperated! Close to town/beach and Farmers Market on Friday. Very well equipped with all the extra necessities. Enjoyed our stay! Our house is directly across the road from a beautiful 7 mile beach and within walking distance of the village of Boca Grande on Gasparilla Island. There are no stop lights, high rises or fast food chains. You will experience peace and quite, breathtaking sunsets, unspoiled nature, unique shopping and casual and fine dining. Guests/travelers are requested to pay all fees using e-check. If they choose to use a credit card, the 3% credit card fee will be an additional fee to the guest paid by personal check or e check to the property owner.